I used colored pencils for this picture. A raw sketch for it was one of my earliest free hand LBT drawings, while I made this colored version some time later. The picture shows a scene from one of my LBT fanfictions. Littlefoot, Cera, Ducky, Petrie, Spike, and Ali are fleeing from the sharptooth in the background. During the flight Ducky (who at first sat on Spike’s back) was separated from the others and only just managed to catch up and overtake the others at this shallow lake shown in the picture (with water being a swimmer’s element). What Ducky calls in the story (“Come on! Come on! Come on!”) became the name for this picture. Sweet. Colored pencils are my favorite medium for drawing as well. Actually I wouldn't call them my favorite. They are not well suited for large spaces, e.g. water and sky in the picture. That's why I prefer Aquarelle colors, which are handled exactly like colored pencils, but can be blured with water later on, so it is much easier to create an even surface, while effects with differen color intensity are possible as well. I think it must've been in my primary school time when I used wax crayons for the last time. I hardly ever combined different painting medias (such as crayons and colored pencils). Usually I stick to one media for one picture. hey, that wasn't the that was on FF.net, was it? The story called The Big Qural? Indeed this picture shows a scene from the Big Quarell. The reunion with Ducky during the flight from sharptooth. It was one of my earliest land before time colored pencil drawings. There is a couple of others on this and other stories I made. Thank you very much. By the time I drew that picture I was still practicing drawing LBT characters by "copying" them into my sketchbook from the TV screen. 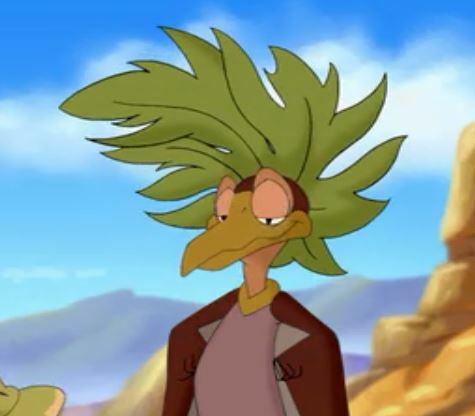 In fact Ducky's posture in this particular picture is likely to be inspired by a similar posture of her in LBT 6 (where she is waving to Littlefoot and Spike who are on the trunk while sharptooth is approaching). In the movie however there was a front view of the waving Ducky while in the picture there is a different angle.